The shoulder-in is one of the best exercises for suppling a horse, building his strength, and increasing his freedom in the shoulder. But the precursor to the shoulder-in is the shoulder-fore, which is also an excellent movement to help with everyday training issues, in particularly the canter. The shoulder-fore is essentially a baby shoulder-in. Riding on the rail, the exercise brings your horse’s shoulders slightly to the inside, and then back to the rail. The shoulder-fore’s greatest asset is creating straightness. If you look at your horse from a bird’s eye view, you’ll notice that he’s wedge shaped, with his haunches being the widest part of the wedge. To keep your horse straight, his shoulders need to be in line with his haunches – meaning his shoulders will be slightly off the track. This is the shoulder-fore. The shoulder-fore requires a lesser degree of angle and bend than the shoulder-in. The aids are the same, but are used with less intensity. Your horse should learn the shoulder-fore first: Once he understands it, the angle can be increased for the shoulder-in. Most riders can’t feel the shoulder-fore, so it is helpful to have an experienced friend or trainer watching from the ground. Develop the shoulder-fore at the trot on a 20-meter circle, asking for only a few steps at a time. If all is going well, you’ll begin to notice your horse moving better and becoming more flexible. Now pick up a canter on the same 20-meter circle, and ask for a few steps of shoulder-fore. Remember the angle is very slight. 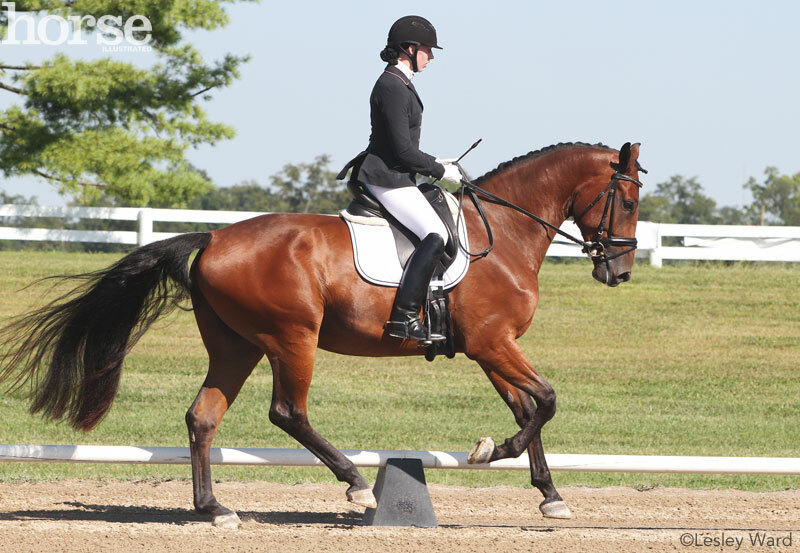 You want your horse’s shoulders in line with his haunches — in other words, a straight canter. Now ride straight ahead around the arena, holding the shoulder-fore as you go. If you feel your horse becoming crooked again, bring him back on the 20-meter circle and re-establish the shoulder-fore. If your horse doesn’t understand at first, be patient. You’re asking him to put more weight on his inside hind leg, and he might resist at first. When you get a few good steps, end the exercise. Horses also tend to swing their haunches in during the upward and downward canter transitions. Be ready for this by asking for a step or two of shoulder-fore before the transition. Besides creating balance, another benefit of the shoulder-fore in the canter is increased strength and weight-bearing on the haunches. 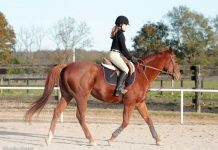 It’s interesting to note that many riders feel that the canter should always be ridden in a shoulder-fore, due the horse’s wedge-shape. You don’t explain how to obtain the shoulder fore in your article. You just say do it – an explanation of how to obtain it – leg position etc would be helpful. I agree w/the comment on how to ask for this shoulder-fore properly. Exactly what I was thinking too! How do we ask for the shoulder fore and shoulder in? I just now watched this video on shoulder fore and have the same question – how do you do it – that has not been answered since 2008?? ?